In conjunction with Murphy's Magic Supplies - complete with necessary Bicycle Mandolin 809 design red-backed playing cards. "The card sword on steroids"
Suitable for stage and close-up performances. The magician is wearing a plain black vest. A playing card is freely chosen by the spectator from a shuffled deck. The card is signed by the spectator and is shuffled back into the deck. 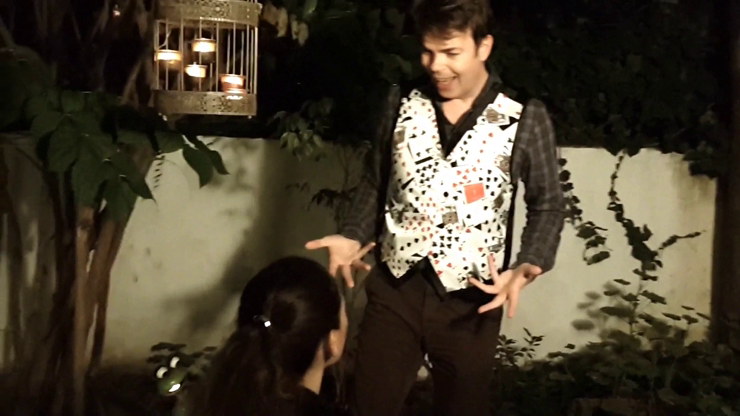 The magician showers the whole deck of cards high in the air above him. The cards land on the floor. It is now seen that the faces of the cards are emblazoned on the vest in a random fashion. One card is seen facing back outward. The scattered cards are seen to have become BLANK faced! The magician offers a solution and suggests that if he turns his back, the face of the turned card will be seen there. Accordingly he turns his back, but to no avail. Upon turning the front once again all cards are now showing back outward. One card is peeled from the design on the vest - it is the chosen SIGNED card! S.C.A.R.E.C.R.O.W - Card on Waistcoat! Vest available in three sizes (M, L and XL). Best quality digitally printed fabrics. New longer length for extra comfort. Complete with easy to follow written instructions. Minimum sleight of hand required.